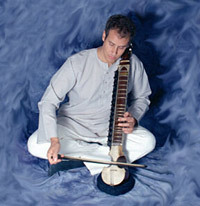 An award-winning musician, composer, vocalist and multi-instrumentalist equally accomplished on tabla, congas, percussion, esraj, guitar, and keyboards, Benjy Wertheimer has performed and recorded with such artists as Krishna Das, Deva Premal and Miten, Jai Uttal, Walter Becker of Steely Dan, virtuoso guitarist Michael Mandrell, tabla master Zakir Hussain, and renowned bamboo flute master G. S. Sachdev. He has also opened for such well-known artists as Carlos Santana, Paul Winter, and Narada Michael Walden. Benjy is a founding member of the internationally acclaimed world fusion ensemble Ancient Future. He began his musical studies at age five, starting with piano and later violin, flamenco guitar, and Afro-Cuban percussion. Benjy has been a student of Indian classical music for over 25 years, sitting with some of the greatest masters of that tradition, including Alla Rakha, Zakir Hussain, Ali Akbar Khan and Z. M. Dagar. Along with the Grateful Dead's Mickey Hart, he was a contributing composer and member of the Zakir Hussain Rhythm Experience. Trained in audio engineering at San Francisco State University, Benjy is also very much in demand as a producer, engineer and studio session musician. For over five years, Benjy scored music for the internationally syndicated NBC series Santa Barbara, and his CD Circle of Fire went to #1 on the international New Age radio charts in 2002. Making his home in Portland, Oregon, he now tours internationally with his wife Heather in the kirtan group Shantala. Frogorian Dance (Ancient Future. 3:38). iTunes. >YTmusic. Benjy Wertheimer does a killer tabla solo on this 1981 recording. Tabla, tinklik, beer cans, and rice paddy frogs jam. From Natural Rhythms (Philo/Rounder 9006) CD- $16.98. Add 1 to Cart. Buy 1 Now. Semara (Montfort. 4:27) iTunes. >YTmusic. Balinese gamelan. Features instruments and rhythms of the Gamelan Semar Pegulingan and performances by the original 1978 lineup of Ancient Future. From Planet Passion. (Ancient-Future.Com AF-2010). CD/Gift Card, $17.98: Add 1 to Cart. Buy 1 Now.